We are currently seeking feedback from Key Users/Contributors about how we are expanding certain areas of data capture in the database. Below is a short (6 min) video in which Jo Croucher (Our Data Manager) and I talk through some of the issues that we are using this abridged version of database to test. Those of you who have been asked to test this have been sent an email. Friday; Feedback two CIs/Editorial Board Members. Too much information on works? is measurement necessary? Too many stubs will be generated if we create record files for each ROLE associated with the production of works ( particularly in design)? Ie. we don’t need a record for Kambrook associated with Musset’s kettle. Just need to be able to note that Kambrook made it. ? Like the way that works can be dividied into parts- helps with complex works. Like the way that Roles will now be searchable. Also appreciate the inclusion of curators and arts professionals. Appreciate the logic of associating medium with work, rather than a person. So person + Role and Medium +work. Both want clear citation and additional reading policies. Agree that we don’t need records for every associate- we need to define primary roles ( ie Creator, curator etc) who get full records and secondary roles ( ie Kambrook in the Musset eg) who don’t. crunch time. reports flowing in. feedback from CIs on phone and questionnaires. there has been lots of information coming in that we need to synthesize, process, and find where it fits in the big jigsaw puzzle. Back to the whiteboard. Last week began with refocussing on the incorporation of more design content. We start on a first pass with a type of centre/edge , type/topos approach. Basically, we find people/groups/case that would constitute an ‘exemplar’ of hegemonic success in a field (in terms of established field criteria like prizes or commissions etc) and map those against other cases that push the borders of what is understood as ‘the field’. We grid the case studies and then overlay the connections between the types that help us think about other methods of organisation. We then drill down in case studies to find tricky cases and map them against conforming ones. We find case studies that our existing schema might have trouble with. For instance, time, is a major axis of historical research- that is to say, it is a key filter that people will use on search queries. In our database this category does a lot of work (as it attaches to so many categories). So we run tests that have time problems. For instance, how to cover the issue of the changing names and principals and partners of design houses? How can we the ‘period active’ category in the existing schema to raise more meaningful searches. As we go through this process it help clarifies how data relates to each other- so we can find the most elegant data design solutions that don’t introduce so many elements that takes us away from our core business of biography ( albeit, a dynamic and expanded notion of what constitutes a creative ‘life’) so we can draw upon and expand our strengths so our content can be sustained in a quality state in an online context. 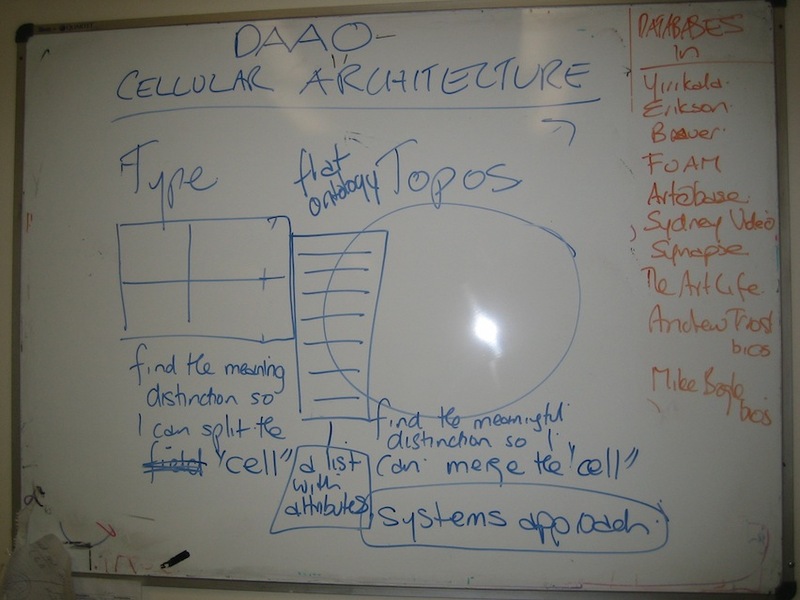 I love iterative whiteboard days. Days of focussing on concrete problems, collaborating with Olivia and Jo, or Ross Harley ( our Lead CI) , or Tom Ruthven (UNSW Library Innovation) among others and working the thoughts though diagrammatically- dumping the thought and the standing back and altering till it finally morphs into something approaching either a ‘design’ or ‘description’..
We may know what we want- what our ideal database might be- but if that is not ground in a good ‘business case’, it won’t be sustainable. This is where the Business Analysis and Technical review plug in. The Technical Review currently being undertaken by Sam Elliot of Doric Order is revealing, unravelling and resolving lots of issues that sometimes may seem tiny but given the intricacies of system ecologies can have huge impact. The good news is that we are discovering that we have quite an agile structure to our data, which will great help us as we add new elements to schema and improve our search functionality when we move in redevelopment stage. Lately, the team’s collective mind has been really focussed on schema design. We have working through the LIEF’s brief which requires that our database have more information on exhibitions, roles ( like curators, clients, gallery directors and secondary roles, like teacher, administrator etc) to help with generating more profound research queries. 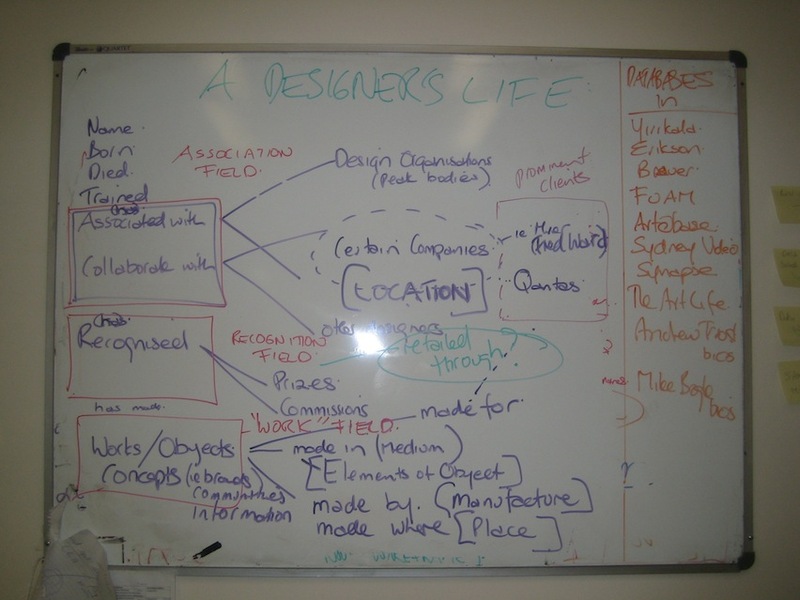 We have of course also been thinking a lot about “design” as a content category and what particular data do we need in order to be able to describe in metadata fields the life of a designer. 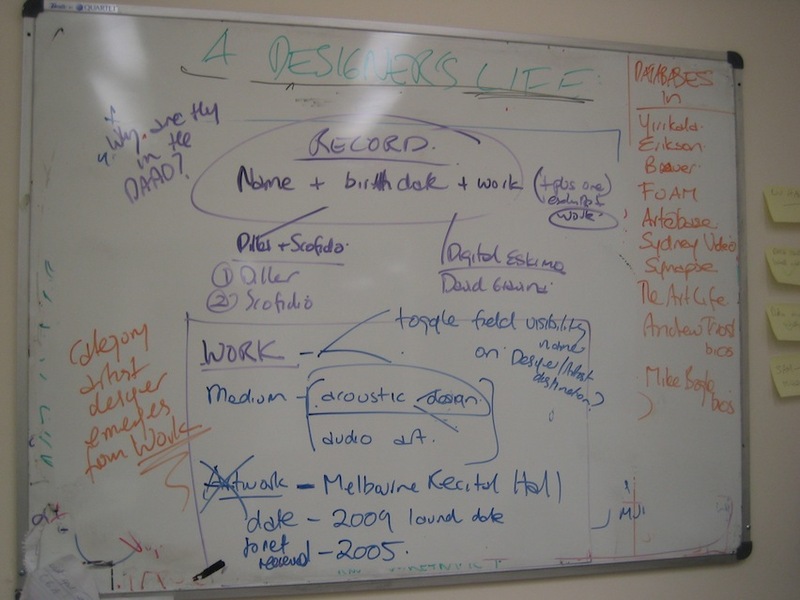 From initial discussions with design researchers, it would seem that schematically- the life of designer has much in common with the life of an artist. Works (in the broadest sense of the term) are produced, often in collaboration with others. Careers are supported by others who collect, curate, commission works. 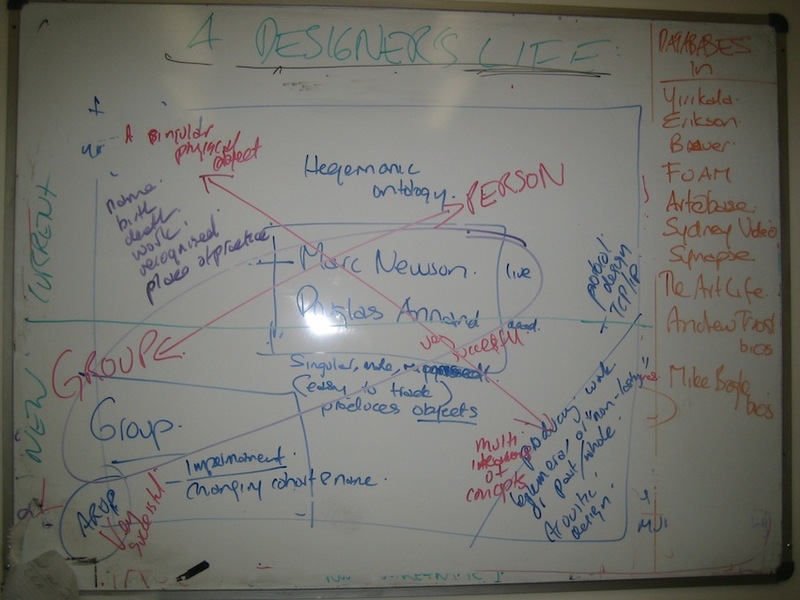 This is great news as it means our definition of ‘a life’ as it is represented in our database is fundamentally robust enough to incorporate a designer. However there are of course some fascinating and fundamental differences that also emerge the more one thinks about design. One of my favorite new fields that I am keen to workshop with people is ‘place of manufacture’. This field emerges as an interesting area in a globalising world of flows in which the client maybe in New York, the designer in Melbourne and the manufacture in korea. It is a classic Manuel Castells, ‘Rise of the Information society’ moment and a database that could capture that information would produce some valuable research ( and the most amazing visualisations!….). Jo, our Data Manager, is well into her analysis of the metadata schema and I am refocussing my energies back on design this week in preparation for the Design workshop later this month. We were discussing our process and Jo helpfully used the word ‘triangulation’ to describe the analytical process. Jo and I share a passion for diagrams and so of course she has whipped one up which deftly represents a synopsis of the process, we are undertaking at present. So basically Jo is working on that HUGE bottom part of the pyramid. I am working the top part ( and a bit of the left side) of the pyramid with various consultants, researchers and you. 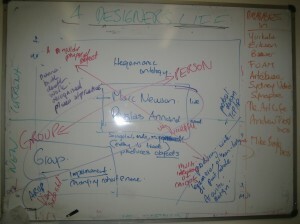 I’ve also been looking at some of our existing content on designers. 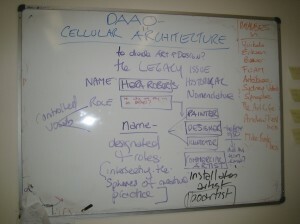 This on Hera Roberts is rather exemplary http://www.daao.org.au/main/read/5391 but if we scroll down what more information would we want in the details? 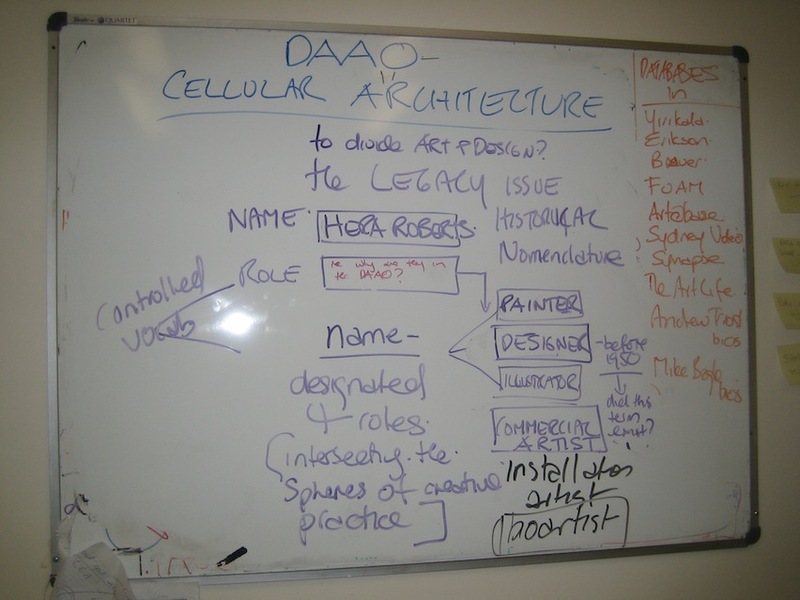 How to build a database that speaks meaningfully to the history of design as well as its present. Word the the week: SERENDIPITY. It seems to be happening all the time in the is project. Just as Olivia and I are thinking ‘wish we had something on artist run initiatives’ Amy Griffith and her database appear ( via Joanna Mendelsohn) Today just as i was thinking, I need to chat to a design researcher, I find myself on the phone with Juliette Peers from RMIT who has helpfully provided me some extremely useful grid references for measures of esteem, historical challenges, exemplary designers and some pointed case studies ( like ARUP or 3Deep) to explore edges of what we need to capture. Its been a big week as we have been concentrating on Schema Design. We have been analysing the new datasets that have been coming our way and continuing our phone and face to face interviews with CIs to clarify and refine exactly how we need to extend over coverage in the ares of Exhibitions, Organisations, Galleries, Curators, Gallery Directors and more. Unfortunately such wonders are not for this LIEF, but we will be able a database which such good structure in this grant, that all kinds of uses of it will be possible for future development. 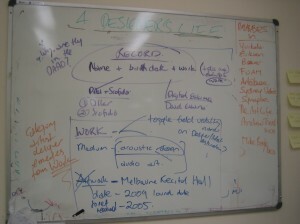 Another highlight of this week has been analysing Amy Griffiths’ research database on Artist Run Initiatives. Capturing the complexity of organisations and exhibitions is a key concern for this LIEF and being gifted such a well researched database on such a vital area really helps us design fields to capture previously elusive information. Amy Griffiths is completing a Masters in Arts Administration at COFA. 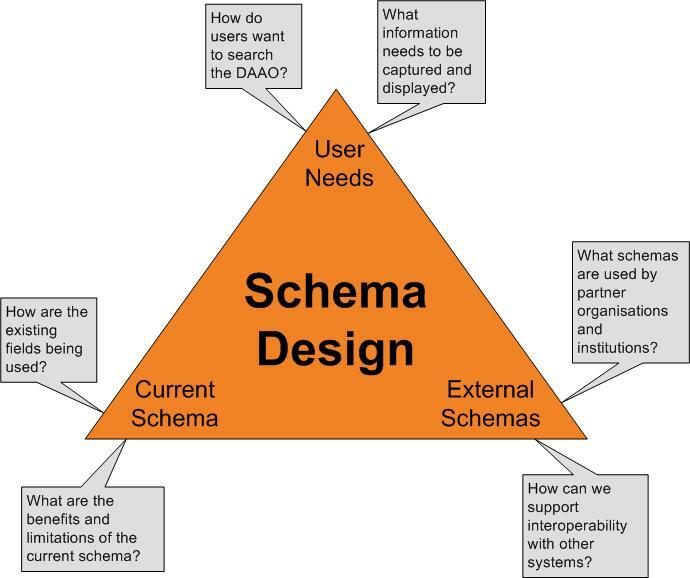 We have now also organised the process of consultation and sign off for the SCHEMA DESIGN stage of this project.TWO advisory groups have been formed to drive the schema refinement and extension; ART Advisory Group and DESIGN Advisory Group. The Editorial Board will ‘shadow’ discussions in both groups ( these will be synopised to keep information manageable) and can contribute to discussions at the same time as the advisory groups. The aim is for consensus between advisory group and editorial board and the process is designed to produce such outcomes. The Diagram below maps the workflow of consulting, testing and sign off. We have begun refining our scenarios and benchmarks. Due to the tight timeline of this project, if we are to launch on time and complete on budget,we need a tight turnaround on feedback from our CIs. We must remain on time. Please book some time in your busy schedules during the relevant weeks for feedback and testing. Each Advisory group will be notified of its timelines by email. Turnaround period will be one week. We will email information for feedback to Groups and Ed Board. We will use online survey to gauge your feedback. WE ALWAYS WELCOME A PHONE CALL. Talking is very efficient. If you feel your feedback cannot be captured by the survey we provide. We can call you. Once we get your feedback, we will make a quick wireframe database so we can test that we are capturing the relationships we need. We will be asking you to test the database by setting it the type of queries you need answered. Again the turnaround period will be one week. Comments Off on Schema Design!